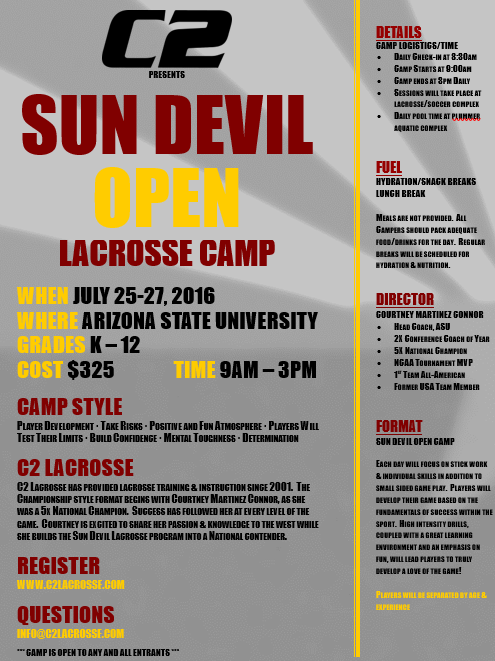 Courtney Connor, Arizona State University's Women's Lacrosse Head Coach, will lead participants through quick moving drills specific to beginner and intermediate players. Focusing on stick work and small sided game play, players will develop their game based on the fundamentals of success within the sport. High intensity drills, coupled with great learning environment and an emphasis on fun, will lead players to truly develop and love the game! Campers will indulge themselves in some of the finest athletic facilities in the country. 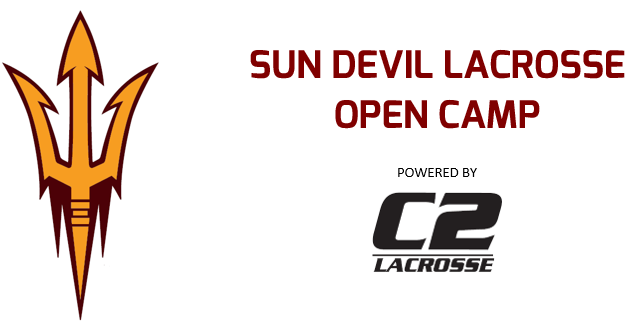 They will compete on the Sun Devil Lacrosse Stadium while also utilizing the Sun Devil Sports Performance building where they will learn about strength/conditioning and nutrition, the Verde Dickey Dome during the mid-day session to cool down as well as the Plummer Aquatic Complex to relax and also discover new training techniques. Courtney Connor brings phenomenal experience both as a player and teacher of the game to the Valley. As a player, Courtney won 5 NCAA Championships at the University of Maryland and was awarded Defender of the Year and NCAA Championship game MVP in 2001. A former US National Team program member, Courtney learned from some of the brightest and most innovative minds in the game. Immediately upon graduation, Courtney was hired as the Head Women's Lacrosse Coach for Mt St Mary's University, a Division 1 program in Maryland where she won NEC Conference Coach of the year in 2004. Courtney then took over at UMBC where she was named America East Conference Coach of the year in 2006 after guiding the Retrievers to their first ever regular season conference title. Her passion to teach the game has also trickled down to the youth as well where she has instructed youth clinics, camps, clubs and recreation program for over 15 years.